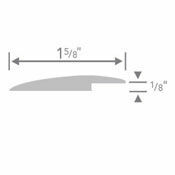 Use this floor reducer for differences in your tile floor transition heights. The heavy duty rubber floor reducer transitions resilient floors from 1/16" to 1/8". This underslung floor reducer is secured with Transition Adhesive. Use either method on your tile floor transition to ensure a strong attachment. This Mannington floor reducer is slip resistant and has been molded as a single piece. The tile floor transition meets American Disability Act (ADA) requirements. Floor reducer will not shrink, giving you a snug fit. Choose this tile floor transition for a gradual and smooth shift in heights. The tile floor transition piece is sold in 35' lengths and can be easily cut to size. Floor reducers are shipped coiled and can be laid flat to straighten out. 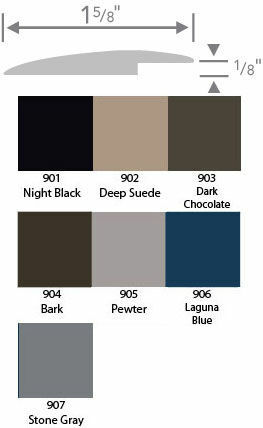 Available colors are shown below but may vary slightly from true color due to your screen settings. Contact us if you need additional information. Order your tile floor transition piece in the corresponding color. Then indicate the number of sections needed. A quantity of 1 is a 35' length.